Sunday in Vampadu | Walk with us! Fr. 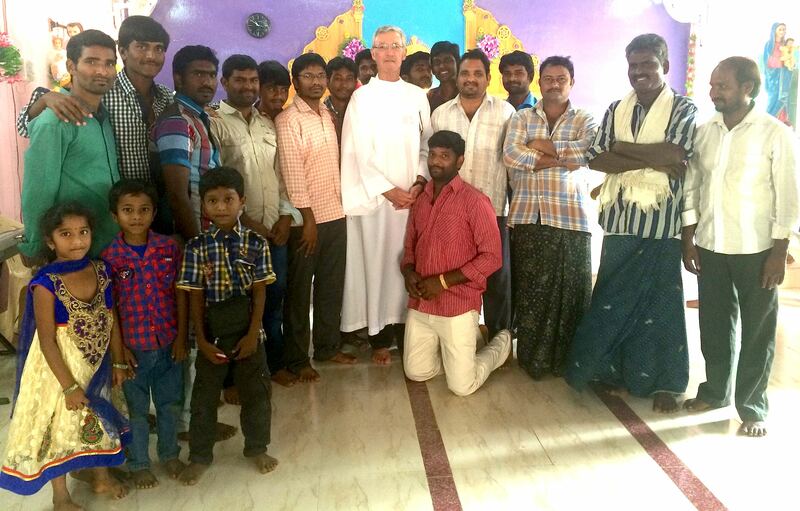 Tom with the Dehonian Youth Group in Vempadu. “On my right is the local village council,” writes Fr. Tom. “It consists of members of the three major faiths: Hindu, Muslim and Catholic. When the district council met in Nambur I promised, Fr. Jojappa Chinthapalli, SCJ, a member of the council and pastor of Sacred Heart Parish, Vempadu, that I would visit him soon and this morning I was able to keep my promise. 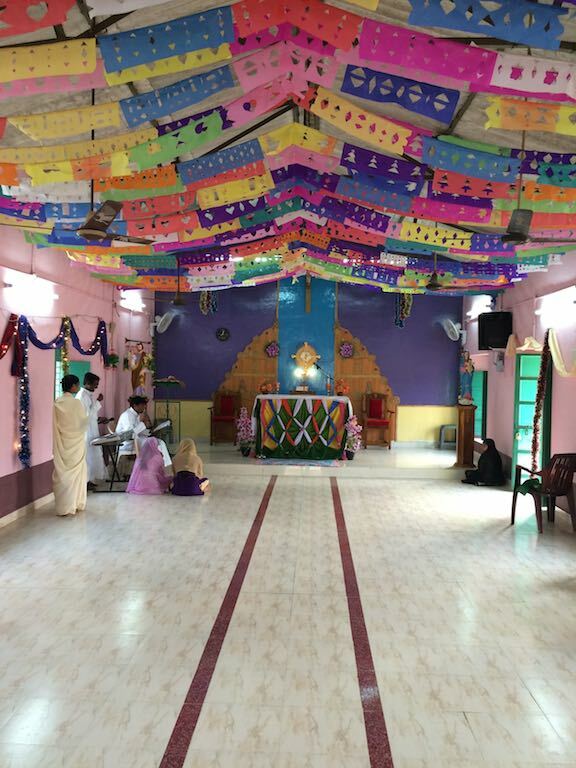 Vempadu is about 35 to 40 kilometers from our scholasticate and is the one parish the SCJs staff in the Diocese of Eluru. In addition to the main church it also has three sub-stations. This morning I was traveling with Fr. Joseph Gopu, SCJ, and four of the students: Joseph Thambi, SCJ, and Harish Kumar, SCJ, both in their second year of theology, and Thambi Joseph, SCJ, and Syam, SCJ, both in their first year of theology. Joseph Thambi and Syam are the house musicians and take turns playing the keyboard and leading the community in song during our various liturgical services. We got on the road around 6:45 am and our first task was to pick up three Dominican sisters who come each Sunday to help with the singing and teaching of catechism after Mass. Before picking up the sisters, we dropped off Br. Vineeth, SCJ and Anu, SCJ who do their Sunday pastoral assignment at the cathedral in Eluru. Once we left Eluru it took us about 20 to 25 minutes to get to Vempadu. Our Mass took about two hours. Of course it was said in the local language so I had to follow along in my English missal. Fr. Jojappa’s homily lasted about 20 minutes. That’s standard for the local area — in fact I was told the people would be disappointed if the homily was any less then that. At the end of Mass I was thanked for the contribution of $5,000 for the building of the bell tower. I told them that they should thank the US Province as I was simply the agent who asked if our province would support this request. The young man who thanked me did it first in Telugu and then in very good English. It turns out he teaches English. While we were celebrating our Mass Fr. Gopu and Brs. Harish and Thambi Joseph along with Br. Suresh, SCJ, took the two motorbikes to say Mass in two of the sub-stations. The roads are in such condition that the motorbike is better suited then the minivan that we came in. I had the chance after Mass to chat with some of the Dehonian youth; most do not know English, or at least that was my presumption. When I say “youth” that can cover between the last two years of high school to, I’m guessing, age 35. All the youth with whom I was talking had full-time jobs which included an electrician, two government workers and an English teacher to name a few. Two of the men were married. Fr. Jojappa said he just started a lay Dehonian group for families. My stay ended when the two motorcycles returned with our brothers and Fr. Gopu and we headed back home, but first dropping off the sisters at the Dominican convent. We were the first to be back and ate our meal before any of the other brothers returned from their respective pastoral assignments.